I have a really exciting product for you to share today!! Let's start by stating what is already clear - drinking water is extremely important for you. You have probably heard it like million times before, but it really does make a difference. I promise. It doesn't only help you with your digestion, but the benefits also include flushing out all of the toxins out of your body, clearing up your skin, helping with weight loss and even improving your mood. But to actually notice all of these changes happening you have to be very strict with the amount of water you drink every single day. I know it's not that simple, but there are some pretty amazing people who made it way easier for you to consume the necessary amount of water every day. 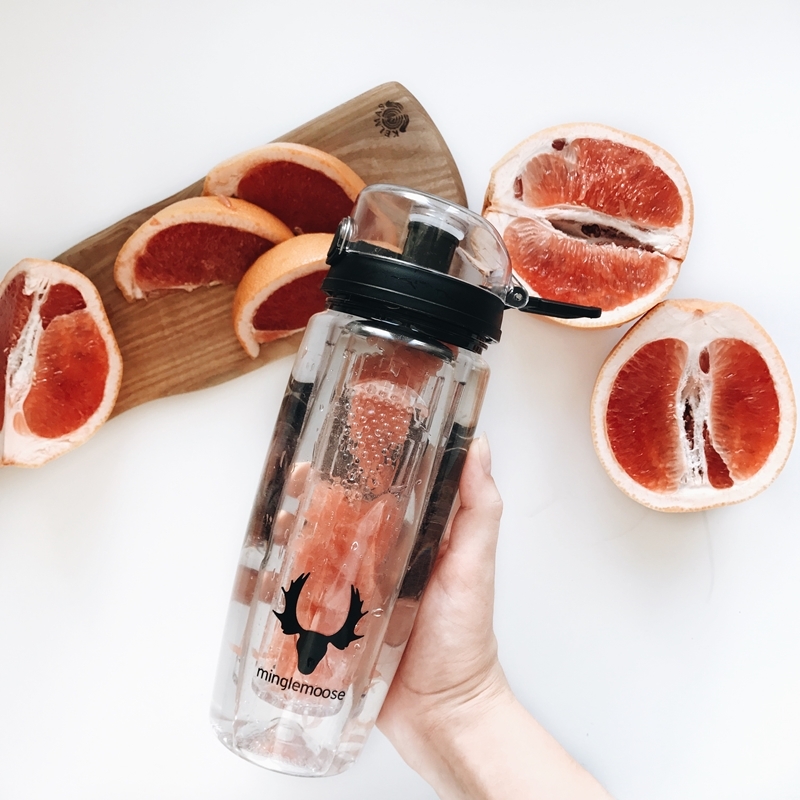 "Minglemoose" water bottle is made specifically for you - to enjoy drinking water much more. 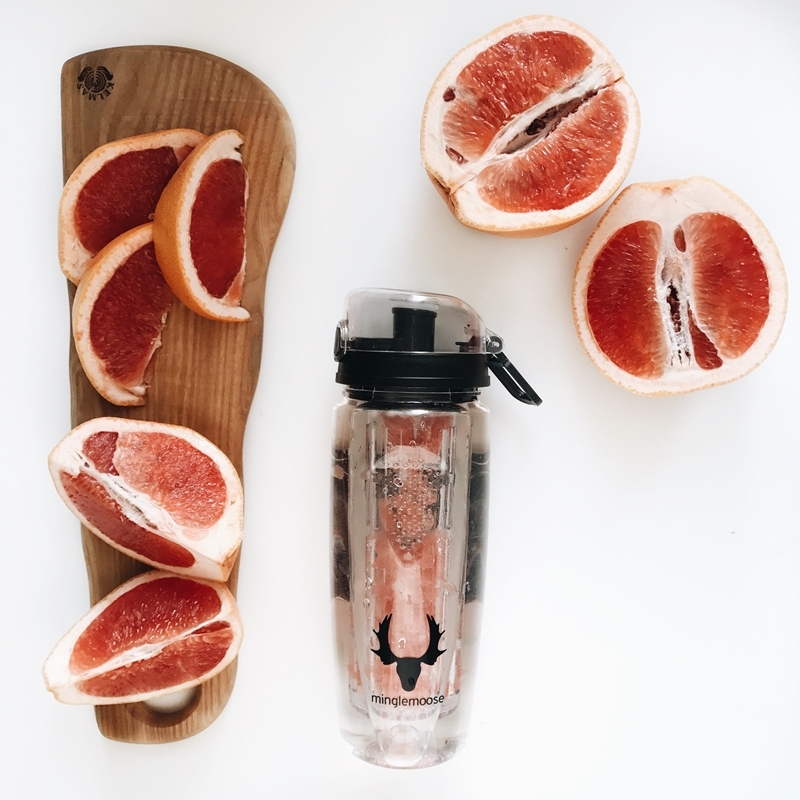 The special container inside is made to mix any kind of fruit and vegetable combinations, so this way you are not only drinking your needed amount of water, but also mixing various possible vitamins and tastes into your drink. This way it's way more fun and beneficial for you and your body. If you ever run out of ideas of what to spice up your drink with - go ahead and check out their website, they have a free recipe book with every single fruit and vegetable combination possible. So you shouldn't get bored with creating a different mix of colors, tastes and vitamins for a long time! Minglemoose is a lithuanian brand - which I am more than happy about. I am always excited to share my thoughts on any kind of lithuanian made products, so this one was a necessity for me. I am genuinely very happy with it. From the whole look of the bottle, which for me looks very classy and modern (they have a different color selection also), to the size of the bottle - everything works out perfectly. So go and give Minglemoose some love, don't forget to check them out and maybe get yourself a new water bottle. Drinking water is so important. Most of the times I am quite good in keeping up and drinking enough water. Totally agree! Staying hydrated is so important! It's so important to drink water! I love this bottle and I totally need to check it out! Water is really good for the entire body system.. this water bottle is a good concept will love to get one. You are so right! Thanks a lot for your reminder!